The Defense Department is looking for a ground-based system that can track multipath signals back to their source — enabling a new way to locate jammers in urban areas. Although multipath signals, that is, signals that have bounced off reflective surfaces, can confuse GPS receivers, recent research suggests that multipath can be used to help locate jammers. The Department of Defense (DoD) is looking for a single-receiver solution able to detect and estimate the location of a jammer within 100 meters using this technique. If networked with with other sensors the system should be able to estimate location within 10 meters. The selected contractor will integrate a prototype of their solution into a representative military ground vehicle and perhaps Federal Aviation Administration equipment. Crosslinks have been included on earlier versions of the GPS satellites enabling, for example, the IIR spacecraft to maintain accuracy for a time after loss of contact with the GPS control segment. Plans for the GPS III spacecraft originally included directional crosslinks but those were deferred for the first 10 GPS III satellites because of the size, weight, power, and cost (SWAP-C) factors involved. The current crosslinks, which have low SWAP-C and non-directional antennas, use the UHF/VHF band. That band is crowded, however, and GPS is a secondary user that must operate on a non-interference basis. Fortunately "new techniques in cognitive radio and dynamic spectrum access (DSA) may permit reconsideration of UHF/VHF for enhanced GPS crosslinks," wrote DoD. This contract will focus on assessing the feasibility of enhanced UHF/VHF crosslinks for GPS using cognitive radio and DSA. The objective is to provide a 1–2 Mbps average data rate for the crosslinks without interring with other users in the band. Using the existing crosslink antennas on GPS, the crosslink architecture should include spectrum sensing and dynamic frequency selection (DFS) to utilize the band on a non-cooperative basis with other band users. In another crosslink solicitation the Department of Defense is looking for ways to boost the data capabilities of potential GPS III crosslinks. GPS Blocks IIR and IIF utilize UHF crosslinks (260 MHz to 290 MHz). As noted above the GPS system shares this band on a secondary basis with a number of users including the Navy UHF Follow-On. The GPS Directorate looked at other bands such as Ka Band (22.55-23.55 GHz) and V-Band (59.3-64.0 GHz) with directional antennas, but was stymied by the demands those approaches entailed. DoD wants to develop a "scalable, flexible lower SWaP-C GPS crosslink capability that allows future operational systems to forego significant dependence upon ground clock and ephemeris refresh with concurrent support of real-time command and control and age of data." The peak data rates per crosslink initially are expected to be approximately 1.5 – 3 Mbps and average data rates are to be approximately 200-700 kbps. The Air Force is seeking a concept for Position, Navigation, and Timing (PNT) augmentation using Low Probability of Intercept (LPI) techniques. The objective is to be able to provide ground users with secure PNT with better-than-10 meter horizontal accuracy in a GPS-denied area. Pseudolites have been previously evaluated for providing precision navigation in denied areas, wrote the Air Force. 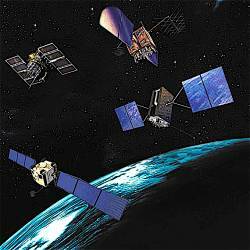 Most concepts have focused on broadcasting GPS-like signals while leveraging the proximity of ground or airborne transmitters to overcome jamming. However, "there has been very little research in the application of ultra-wideband (UWB) or other LPI techniques to provide PNT," said the solicitation. "The proliferation of digital radio networks illustrates that a hybrid approach may be suitable, one which provides tactical communications in conjunction with PNT." Over this three-phase project the awardee will develop its concept through a prototype that can be tested on multiple ground vehicles in a GPS-denied environment. The Navy is looking for PNT technology able to support operations in areas where the GPS signal is either degraded or denied. The goal is to "research, develop, integrate and test innovative, affordable, robust, intelligent, and adaptable" alternatives for precise PNT systems that integrate multiple sensors and sources of information. Optimally the system developed under this contract will be able to fuse navigation information and transition seamlessly between using signals and sensors, depending on the interference present and the sources available. Among the candidate technologies are an integrated military GPS/Inertial Navigation System (INS) — a solution that preferably combines "enhanced-long range navigation (e-LORAN) signals or possibly ground terrain mapping with chip scale atomic clocks (CSAC)." The awardee will develop, integrate and test the system as well as develop and demonstrate prototypes. To overcome some of the issues with GPS the Defense Department is seeking an alternate means for PNT, or a redundant GPS capability, that will enable Special Operations Forces aircraft to acquire and maintain accurate PNT without the GPS signal. In Phase I the contractor will do a feasibility study of technology alternatives that, among other capabilities, provide equal or better accuracy than GPS, are backward compatible for current military equipment, have near real-time control and are resistant to blind spots, jamming and spoofing. In Phase II the winning contractor will develop a prototype to demonstrate the selected technology. The Air Force is seeking a signal acquisition engine that would enable direct acquisition of the GPS M-Code with a time to first fix (TTFF) of 120 seconds with initial time uncertainty (ITU) of 10 ms and jamming/signal ratio of less than or equal to 51 dB. Given that the traditional method of using the coarse/acquisition (C/A)-code to acquire M Code is vulnerable to jamming and spoofing, a full, direct M-Code acquisition engine was developed and implemented in an Application Specific Integrated Circuit (ASIC). This effort, completed in 2004, used a bank of Code Matched Filters (CMFs) and Fast Fourier Transmitter (FFT) techniques to implement a high-performance acquisition engine. A proof of concept of the technology was achieved by optimizing sampling rates and quantization levels and using single sideband processing with noncoherent combining. The type of jamming to be considered is a composite of multiple jammers yielding a Gaussian amplitude distribution and a power spectral density shape equivalent to M-Code. The 51 dB J/S should be referenced to signal power levels ranging from -158 dBW to -133 dBW. The winning contractor will develop a preliminary design and ultimately demonstrate it using a brassboard prototype. The US Geological Survey (USGS) is incorporating GPS receivers into the existing telemetry of its Northern California Seismic Network (NCSN). Officials are looking for a contractor to help identify which of approximately 120 existing GPS stations can be connected to the approximately 105 USGS-operated seismic stations through northern and central California. The contactor will be provided with lists of sites and radio link information. The USGS has already completed an initial study of line-of-site (LOS) between all of the possible pairs of GPS and Northern California Seismic Network (NCSN) sites and selected those pairs for which LOS seems likely for inter-site distances of less than 60 kilometers.